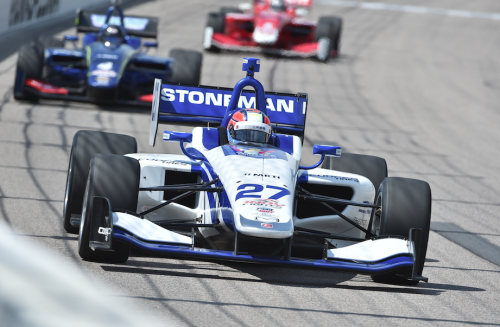 Indy Lights Presented by Cooper Tires, Iowa Speedway, Iowa, USA, 10th July 2016 Dean Stoneman maintained his championship push with a 4th place keeping him just 23 points off the title lead. Rookie Stoneman, racing at just his third oval track of his career, was hoping to take some of his experience from his famous win in the Indy 100 at Indianapolis in May to maintain his position as championship contender for this season’s Indy Lights series. Heavy rain had put the race in doubt earlier in the day as storms hit the Iowa circuit positioned in the middle of America’s mid west Corn growing capital. But as the rain faded it was just qualifying which was cancelled, meaning championship positions determined the starting grid. As the pace car went in at the start Stoneman maintained his second place and looked strong behind the lead car as the 25 year old eyed up his third victory of his maiden season in the US. But as the 100 lap race unfolded Stoneman was suffering from under-steer. The young Brit, battled hard to hang on the second including a great duel with Veach, but the talented Andretti driver was unable to prevent a slip of two places to fourth. In the closing twenty laps Stoneman made something of a recovery and closed the gap to 3rd to les than one second, but with back markers holding up his progress the Southampton based driver’s race ended to soon to claw back another place. The Indy Lights championship now moves to Toronto Canada next weekend.